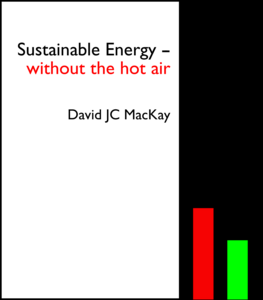 My friend David MacKay gave a splendid lecture this evening to mark the publication of his book, Sustainable Energy – without the hot air. Many years in the making, this is a masterpiece: beautifully produced, thoroughly researched, and intelligently presented. I suspect it will become required reading for anyone really interested in the topic of sustainable energy: how to generate it, and how to use less of it. And yet it lives up to its name, being delightfully un-stuffy. David is more interested in spreading sense than in making money, and you can download the book for free if wanted from withouthotair.com. Almost all of the materials are under a Creative Commons licence and he’s made high-resolution versions of most of the figures available on the web site. But I recommend buying it: the book itself is very aesthetically pleasing, and could make a good Christmas present.